In 1972 Oldsmobile teamed up with Hurst Performance Products to build a modified Cutlass. They called it the “Hurst/Olds” – and collectors are crazy about them. In 1972, a convertible example was used as the pace car – the first time in speedway history that an automotive parts manufacturer’s name was included in the pace car title. 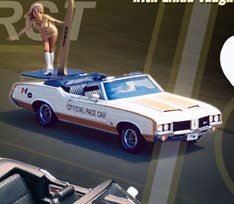 It was a bold step – and so was the manufacture of this figure of Hurst’s “Miss Golden Shifter”, Linda Vaughan, perched atop a scale model of the trunk-mounted platform she rode at Indy, and at other pre-race promotional events. We’ve got a sample on its way – stand by for a full review in the coming days!